New Jersey will be red-light-camera free at midnight, about 10 months after Brick led the way. The statewide pilot program is over, which means drivers no longer have to worry about having their picture snapped and receiving a ticket for numerous offenses the cameras once caught. 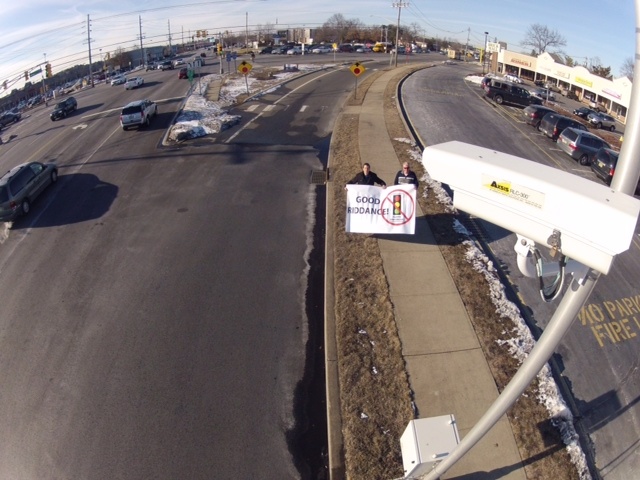 Though initially heralded as a tool to improve safety at dangerous intersections and free up police resources, the cameras began to fall out of favor with New Jersey residents once they were implemented, with motorists coming around to the viewpoint that revenue generation was the prime driver of the program. Indeed, Brick Township took in a hefty $813,000 during 2013, but Mayor John Ducey said the profits were not worth the pain for drivers, especially after statistics showed accidents actually increased in one area where the cameras were in use. “I am happy to see the rest of the state catch up to us here in Brick,” said Ducey, who turned off the cameras within weeks of taking office in January, making Brick the first town in New Jersey to ditch the devices. Ducey said he then looked internally to the Brick Township Police Department for accident statistics, which showed the number of right-angle crashes – the type the cameras are supposed to deter – either stayed the same as before the cameras were installed or had risen. At the township’s first intersection to receive cameras – Brick Boulevard and Hooper Avenue – there were 28 accidents in 2013, including eight right angle accidents, compared with 13 accidents and five right angle accidents the year before the cameras were installed. The end of the pilot program was being celebrated as an early Christmas gift for New Jerseyans by Assemblyman Declan O’Scanlon (R-Monmouth), who stood next to one of Brick’s cameras with a giant “Good Riddance” sign when they were removed in early 2014. O’Scanlon has come out as the state’s most vocal opponent to the cameras, citing the fact that drivers paid $30 in cost for every $1 of savings to their local governments when ticketed, with some of the tickets having been issued under odd circumstances, such as a legal right turn on red that was made too fast, or in some cases, drivers going through a red light at the direction of a police officer. “The reason why this equipment doesn’t improve safety is that the folks causing accidents at intersections aren’t homicidal maniacs choosing to barrel through an intersection – they are you and me on a bad day with a sick kid in the back or worried about work,” O’Scanlon said. Beyond that, he said, truly dangerous drivers aren’t deterred anyway – and the cameras don’t change “driver behavior,” they just drive people away from areas where the cameras are in place. “The ‘driver behavior’ that the camera companies’ trumpet isn’t contributing to accidents, it is drivers avoiding the intersections entirely because of this ticketing scam or simply refusing to ever make even perfectly safe right turns on red,” O’Scanlon said. That aspect of removing the cameras has rung true in Brick, the mayor says. “People no longer have the stress in driving through Brick and our businesses have more out of towners coming since the threat of receiving a red light camera ticket is gone,” said Ducey.